Indulging in pasta could help people lose weight, new research suggests. Eating just over three servings of the Italian staple every seven days causes people to lose around 1.1lb (0.5kg) in 12 weeks, a study found today. 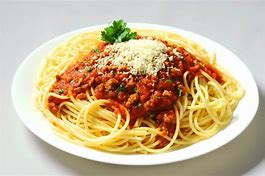 Unlike most other refined carbohydrates, pasta, such as spaghetti and macaroni, has a lower GI index and therefore does not cause extreme blood-sugar spikes, according to researchers. Previous research suggests low-GI foods are more satisfying and therefore delay people’s hunger, while therefore limiting their calorie intakes. Speaking of the results, Dr Sievenpiper said: ‘The study found that pasta didn’t contribute to weight gain or increase in body fat. The researchers add further investigation is required to determine if pasta can be eaten as part of other diets, aside from low-GI plans, without causing weight gain. The researchers analysed a total of 2,448 people from 29 studies investigating the affects of eating pasta over other carbohydrates. The participants ate around 3.3 servings of pasta a week. A serving equals approximately half a cup of cooked pasta. The findings were published in the journal BMJ Open. This comes after research released last February suggested eating fruits, vegetables and whole grains slashes people’s risk of depression by more than 10 percent. Following the so-called ‘DASH diet’ reduces people’s likelihood of developing the mental-health disorder by up to 11 percent, a study by Rush University in Chicago found. Those who eat a typical Western diet, which is rich in processed foods and sugar, are more at risk of suffering depression, the research adds. Researchers add further studies are required to determine the association between diet and mental health, but add simple lifestyle changes may be preferred over medication to control such conditions. Previous research suggests eating lots of fresh produce benefits people’s mental health by improving their moods, giving them more energy and helping them to think clearly. Around seven percent of adults in the US suffer from depression every year. 0 Response to "Eating Pasta (Spagehetti) can help you lose weight, Research says"